It’s hard to believe 30 years have passed since fellow campaigners at Walter Mondale HQ introduced me to Ethiopian food at the (now, sadly, closed) Red Sea restaurant in Adams Morgan. My first time there I fell in love with a dish called kitfo. 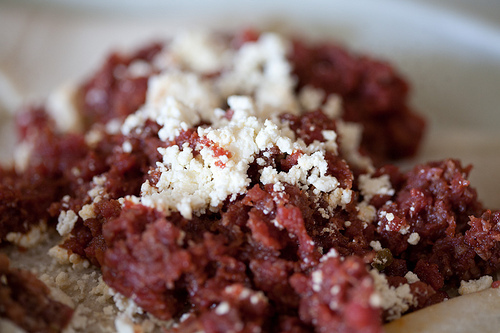 Kitfo is chopped raw lean beef mixed with spiced butter, similar to steak tartare but with Ethiopian seasonings. It’s usually served with greens and a sort of cottage cheese called ayeb. It’s the dish by which I judge Ethiopian restaurants in the US, and it’s the one I crave when I’ve been away from Little Ethiopia for too long. Although kitfo is available in various states of cooked-ness – two possible options are all the way cooked, like crumbly hamburger, and “lebleb”, which is slightly browned and warm – I am of the opinion that it tastes best when it’s plain old raw. Now that I’m here in Big Ethiopia, guess how sad I was when my new faranji friends told me I shouldn’t eat raw kitfo here. You probably don’t want to read the gory details. But there is some bad funky stuff you can get from uncooked meat in this part of the world. I find that there are always a few daredevils in the group. One colleague tells me her husband eats piles of kitfo and lives with the consequences (frequent de-wormings and the occasional bout of typhoid). I’ve indulged on only two occasions since we’ve been here, both at the same restaurant. So far, so good. And I’m starting to get those cravings again. Must be a full moon. This entry was posted in Ethiopia, Food. Bookmark the permalink. I’m heading your way in July as one of the new upper elementary teachers, and your blog has given me a small glimpse of what to expect.. Thank you, Mary! I look forward to meeting you too. I wish you happy and safe travels this summer. See you in August! you tried kitfo the FIRST TIME you had ethiopian food? did you know what it was? or is the world just more paranoid about that stuff now than then? Didn’t think twice. The mad cow disease thing in Britain didn’t happen until 1986; the worst thing you might have gotten from raw beef in America was E.coli, but this was also before there was much concern about that either. Kitfo is made from hand-chopped beef so you don’t have the contamination risk that goes with large-scale hamburger patty manufacturing. But as I say, no one I knew even thought about that at the time. The world (and maybe especially America) is more paranoid now than it was then, about lots of things. This was before AIDS, before 9/11; we didn’t know what a nice little bubble we were in.